• The charger delivers 1 Watt of power at 12 volts – enough to easily keep a battery maintained. 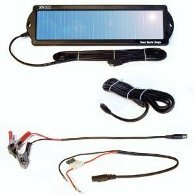 • The solar panel is small, about 20” by 6”, and weighs a little over 1.5 pounds. • It has built-in protection against overcharging or draining the battery, so the battery can be hooked up for extended periods without damage. • The SunForce 50013 comes with an 8’ battery cable, a 1’ set of battery clamps and a 1’ set of quick connect “O” ring connectors with an inline 1 Amp fuse. • Finally, the panel is weather and water resistant and will charge a battery on both sunny and cloudy days. As with all products, the Sunforce 50013 has both positives and negatives. • Easy to set up. Just face the panel towards the sun, and connect the cable to the battery. The battery doesn’t have to be removed or disconnected from the vehicle. • Easy to maintain. Actually, there isn’t any maintenance except occasionally wiping the face of the panel with a smooth cloth to remove water and dust. • Weather and waterproof, so it can be used practically anywhere at anytime. • Low cost – the panel is cheap enough to have one per vehicle. • There’s no way to tell if the panel is operating correctly without hooking up a voltmeter to measure the charging voltage. An LED indicator would have been a nice feature. • The 8′ battery cable cannot be extended without causing a voltage drop, which will prevent the panel from charging the battery. • While this charger will have enough juice to top off a battery and does provide a sufficient “trickle” charge for battery maintenance, it may not be the best choice for charging a fully drained battery in a timely manner. In conclusion, when used for maintaining batteries, the Sunforce 50013 packs a lot of punch for a small price.